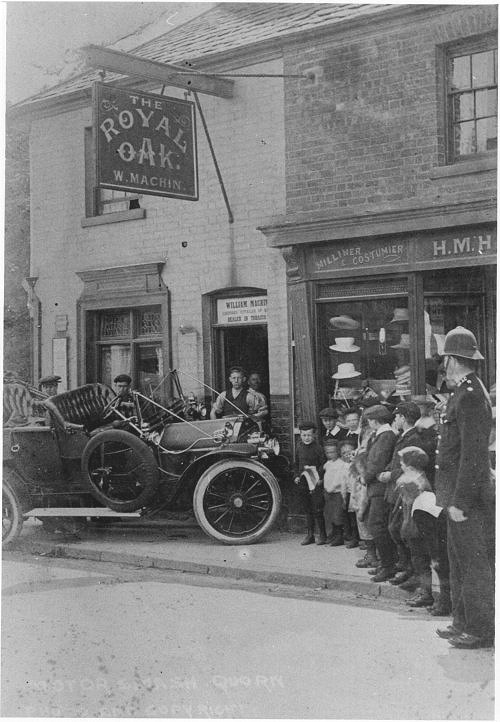 Car crash at the Royal Oak Pub, 1917. Clearly a major event for everyone including a policeman to turn out for a village photograph.The pub is still open with the same name. The milliner's shop is now a restaurant. A somewhat serious accident occurred about mid-day on Monday at the cross roads in the centre of the village. A motor van belonging to the Loughborough branch of Messrs Olivers, Ltd., was being driven along the Station Road by a young man named Harold Widdowson, of Station Street, Loughborough, towards Meeting Street, in the direction of Woodhouse. A five-seater Overland car, driven by Mr Hugh Jones, of Barkby Road, Syston, traveller for Messrs A and W Evans, of Soar Mills, Leicester, was proceeding towards Loughborough, and the vehicles collided in the centre of the road, the force of the impact being such that both vehicles were turned completely round, and forced into the wall of the Royal Oak, public house. The car was badly damaged, the footboard and mud guards were torn off, and the rear off wheel collapsed. Mr Jones being badly injured. He was assisted out of the wreckage and taken to the house of Mr Waddington, and Dr Unitt sent for, who attended to his injuries, and another car was then forthcoming from his employers, in which he was conveyed to his home. The driver of the van escaped uninjured, but his assistant, Frank Hutt, of Hartington Street, Loughborough, was badly cut by being thrown against the wind screen. His injuries were also attended to, and he was conveyed home. The van was damaged about the fore-carriage.